Trust Flow is a great metric by which to measure the importance of a website or a web page. However, it’s clear to most people who use Majestic a lot that Trust Flow can rise and fall over time. Now, those important changes in value can be instantly found through the new Flow History Tool. As Dixon mentioned in his post last month, the capacity of the history tool has been increased from 6 months to 18 months of data. This is the gateway to an incredible amount of information on both Trust Flow and Citation Flow. I’m particularly interested in Trust Flow but the tool also allows exploring Citation Flow. In this article, I’ll work through the type of data that you can get, and why it’s important. It’s still early days so rather than giving definitive guidelines, I’ll run through a quick example and share 5 early observations that might be worth debating. This video has now been added to our free Video course on Udemy, where we know have over 9,000 students. You can check out the course at https://www.udemy.com/getup-to-speed-with-majestic-link-building. you can compare how your client has performed against their direct competitors over a defined period of time. the history tool gives you a neat way of showing the benefit of your work and the success you have achieved – very helpful in retaining clients. I found a list of 15 start-ups from 2015 in this article, 15 of the fastest growing startups in the world still flying under the radar. 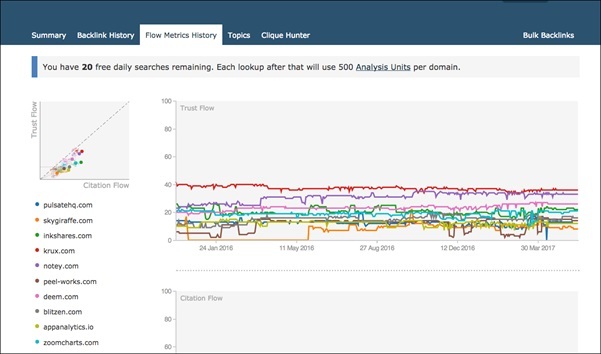 The Flow Metrics History tool compares up to 10 domains so I wanted to select the top ones. I grabbed the 15 domains, entered them into the Bulk Backlinks tool and ranked them by referring domains. From this, I chose the top 10 domains, adding them to the bucket and then sending them to the Flow Metrics History tool. Now, at first glance you might find the results a bit overwhelming but the designers have made the chart interactive so that it’s easy to dig down to the detail. You can of course do this for each ‘domain line’ and see the value at any point along the line. As you can see for Notey.com, the Trust Flow score at the start of the period was 23 on 4 December 2015, and on 23 May 2017 had risen to a score of 33. And the results can be downloaded as a spreadsheet file. How did the metrics change over time? and one remained the same. So Notey, Skygiraffe abd Peel-Works made the largest gains, while Krux, Inkshares and PulsatehQ saw small drops. It’s early days yet, but I’m really excited about the potential of Historical Trust Flow. 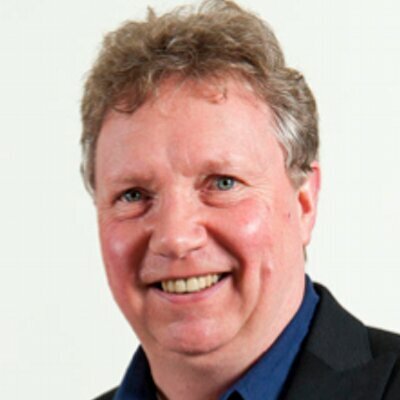 I think it can be a valuable way to gain insight into competitive environments, and perhaps, just as importantly, demonstrate the value of SEO and link building work that has been undertaken. I think it’s important to start testing the Flow Metrics History tool now, and explore how the results can be applied to your own situation. Here are some of my observations – which may or may not be correct. I’m going to look forward to testing them out over the next few months, and would be delighted to hear your comments below. Changes in Trust Flow metrics will be ‘slow burn’ rather than dramatic. You’ll be likely to see only small changes over a period of time. 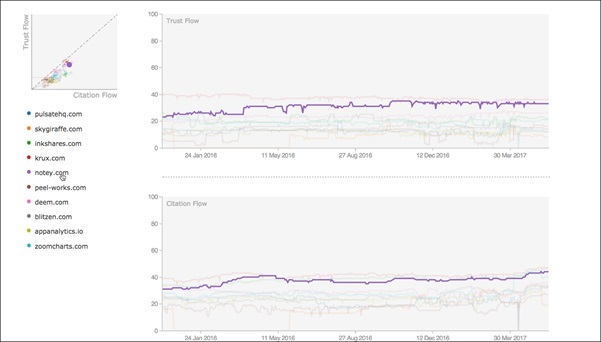 Changes in Citation Flow will probably be more dramatic – however I don’t think those are as important. Managing increases in Trust Flow, say by 5 points, may be significant – but not that easy to achieve. So to achieve an increase in Trust Flow from say, 25 to 30 will be a big leap. Changes in Trust Flow will tend to be on the conservative side. I think once established, reductions in Trust Flow will be less common than increases. The higher your Trust Flow, the more difficult to raise it. As higher levels of trust flow are reached for strong domains, the task of improving them further will be increasingly difficult. Active steps to increase trust flow will involve much more than traditional link building. Solid link building is of course a good start, but that will need to be accompanied by other significant work – good PR, building strong partnerships, gaining acceptance in the marketplace and building a loyal customer base. So what do you think of the tool and my observations? What have I missed and what would you like to add? Hi ken, it would be interesting to see the traffic changes for these domains and to compare them against the competitors in their niches. Yes, Amir – that’s spot on! I think this tool opens up many new ways of looking at link analysis. 1 domain has 1 high TF backlink and hundreds of spam links, another one has a lot of hight TF backlinks, yet the overall TF of both is similar. 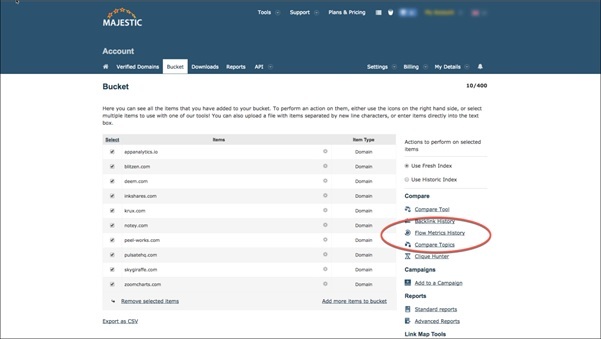 -On site explorer backlink section show the titles of pages that are linking to the site you’re analyzing. -On site explorer backlink section show the total outbound links for pages that are linking to the site you’re analyzing. Depends how you look at that, Edgar. It can be argued that you demonstrate in the image PERFECTLY why TF and CF is useful when you see the spread like that, but the data does need to be interpreted. The image clearly shows the distribution on the "spam" site to be… well the very definition of spam. It is totally possible for one good link to mask 1,000 bad links when you put a thousand data points into two 2-digit numbers. I most certainly agree that the titles of pages on the backlinks section and the outbound link count would both be very useful. Implementing both of those is indeed mind boggling. I am not the database storage expert here, but one thing we are really proud of on Majestic is the speed. To get this speed, the data needs to be pre-ordered before it is requested "on demand". That means we would need to either "flag" pages with known titles in then dataset and then look then up on the fly (which I think we have because you can see titles in the summary page when crawled) or find a way to add storage space in the same memory area of the index for the "memory a title takes to store" X every single link. That is a lot more than the 1,247,848,737,382 URLs in our system, it is EVERY LINK TO Every one of the 1,247,848,737,382 URLs, This is a number so large we not only do not publish it, we can’t even contemplete accurately calculating it. That is not to say that we should not be striving for the titles on the backlink pages. I think we should. In the meantime – a really good way to get this is to export the links (I use the down arrow "<a href="https://blog.majestic.com/development/raw-download-made-easy/">raw export</a>" feature, not the Export data button) and then put the source URLs through Screaming Frog or URL Profiler or SEO Toosl fr Excel to pull out both the titles and the outbound link data.